The crew that installed our solar panels this week were Johnny-on-the-spot at 6:30 AM on Tuesday, Wednesday and Thursday. For a couple who have adapted to a work schedule of 2 PM to midnight, we're both feeling a bit sleep-deprived, but the panels are up! 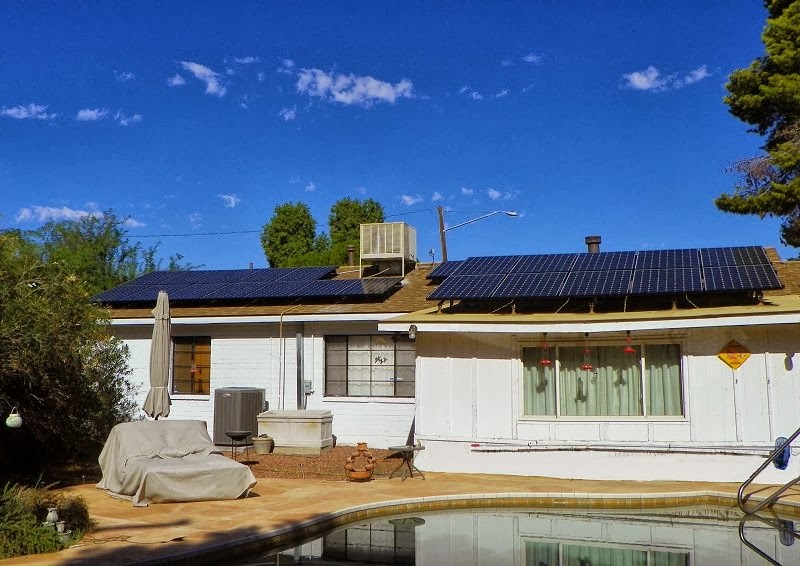 When you decide to go solar, the company performing the installation check out your property, design a system to meet your needs, and your electric company has to approve the design. 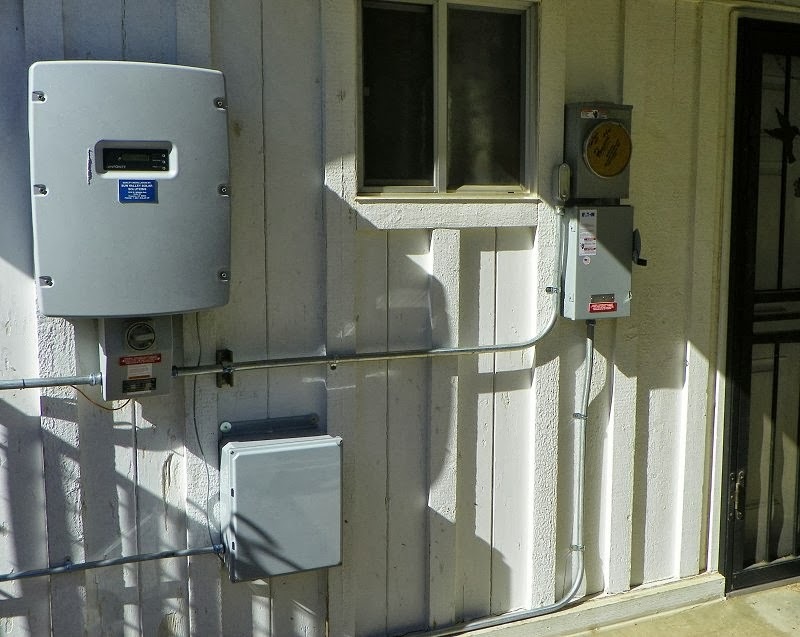 After the system is installed, both the city and the electric company have to approve the work before the solar panels are actually switched on and begin generating power. If you think solar panels are slapped up on your roof and hooked up by a space-age extension cord to everything in your house that needs electricity, think again. Here are all sorts of new boxes on the side of the house to monitor our solar system. Denis walked in and out of the door to the right and never even noticed them the very first day. Can you say SLEEP-DEPRIVED? I also realize that some people are concerned about how a solar system will affect the appearance of their house. It's never been a prime concern of ours, but I will admit that I'm happy that our house is situated such that the panels are on the back side and not visible from the street. There are three large banks of solar panels up there. The bank on the family room roof is hiding the one behind it in the photo. In its entirety, this is a 9 kilowatt system that should provide more power than we need on all but the worst days of summer. What's grin-inducing is to be sitting in the pool and continuously getting glimpses of those panels on the family room roof out of the corner of my eye. I keep feeling as though the Mother Ship has landed! It won't take long to get used to, and I really don't think they're unsightly anyway. Links? Ack! 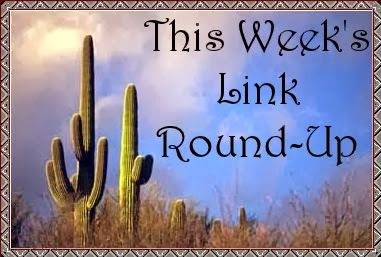 This is the link round-up post, isn't it? Thanks for the reminder! A dying squirrel gets help from a kind warrant officer. Amazon's interactive map of regional food based on cookbook titles. A couple finds 2,000-year-old archaeological treasures under their house. The majority of children in Russia read eBooks, although the habit is not without drawbacks. There's a school in Norway that has banned tablets and Smartphone devices-- for a good reason. Author James Patterson is donating $1 million of his own money to independent bookstores. J.K. Rowling says she's prouder of being a single mother than of any other part of her life. Something tells me that my own mother would say the same thing if she could. Did you know that there's a cat in Russia who wears a bow tie every day as he goes to work at the library? The women who mapped the universe and still couldn't get any respect. The identity of the first African-American woman to write a novel has been discovered. An ancient forest is thawing from its tomb in an Alaskan glacier. Know of anyone who needs an author assistant? I would have loved to have seen this abandoned treehouse in its heyday! Diana Beltran Herrera's flock of paper birds are incredible! The 15 greatest kid detectives. The 10 best narrators in literature. 50 works of fiction in translation that every English speaker should read. If famous writers had Instagram. That's all for this week. Be sure to stop by next weekend when I'll have a freshly selected batch of links for your surfing pleasure. Have a great weekend, everyone! I don't think the solar panels are unsightly either. I think they look terrific! I can't wait until everything is checked out and approved so the system can go live! Cathy - Congratulations on getting those panels up and running. That's wonderful! Thanks for sharing. And thanks as ever for that linkfest. Lots of goodies there as ever.